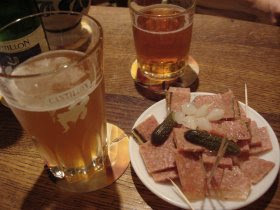 Thirsty Pilgrim: Saturday Morny and Lambic Horny at Cantillon. I'm a card-carrying, dues-paying member of the Brussels Museum of Gueuze. In other words, I give €15 per year to the Cantillon lambic brewery. This is a practical matter as much as anything else. I'd been taking several guests per year there and paying five euro-duckets each time. With membership I no longer pay when taking the self-led tour for the umpteenth time. Also I get a letter every few months with an insider's scoop of what's going on at the brewery. For example: Did you know that the grocery store chain Delhaize sells Cantillon gueuze and kriek to the tune of 25,000 bottles a year? Well, they don't. Not anymore. Delhaize dropped Cantillon in May. That should have been a tough blow, except all that volume went to exports and an uptick in sales at the brewery. It's all in the letter. Read it and weep, Food Lion! And did you know that the celebrated Kriek Lou Pépé was made this year with frozen organic cherries from Turkey? "The result was a (pleasant) surprise," esteemed patriarch Jean-Pierre Van Roy writes in the letter, "and gave us new ideas." 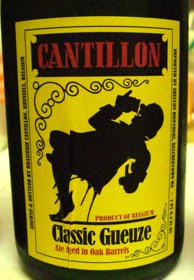 There's a reason I'm bringing all of this up, besides the fact that this is a Brussels-based beer blog, gueuze is the Champagne of Brussels, and Cantillon is the only real brewery left in town. That reason is that November is a big month for devotees of the lambic house on Gheude street. This Saturday is the Cantillon's Open Brewing Day. It's a chance to tour the brewery, pepper the brewer with questions, and see the magical coolship and barrels up close. Now if you're asking, "How does that make it different from any other day that Cantillon is brewing?" – well then, you're a very smart person. Here's the difference: The tour is free, and so are the coffee and croissants if you get there inhumanly early when the most interesting brewing is going on. That's also when you'll be in a small company of hard-core enthusiasts so dedicated that they wake up before dawn and stand around thinking seriously of having their first glass of the sour stuff around 8:30 a.m. I don't recommend going in the afternoon, when there are bigger crowds and often a wait for tours that may or may not be in your language. I'm more excited about Quintessence on November 22. Imagine a "progressive" party where each successive room offers a world-class lambic paired with world-class, locally made food. Ten courses. This goes from 10 a.m. to 4 p.m. and costs €15 a head for non-members. It's €12 for us card-carrying elites. Instead of describe the menu to you, I'm just going to paste the whole thing below. Just to make you drool. Book now if you want to partake. I hope that works out, drop me a line if it does.